It works with tea or coffee, brunch or dessert, and can be dressed up or down, depending on the occasion. Apple cake stands alone; it requires nothing save perhaps a dusting of powdered sugar to spiffy it up, and doesn't rely on filling and frosting to meet its full potential. Back in March when I was recovering at home from the birth of my second son, Mateo, my good friend and neighbor, Linda, brought over a box of home cooked food. There were at least three meals worth of hot dinners, warm artichoke dip with pita, a salad and her famous apple cake. After the hospital food (which I barely survived), her cake tasted like the best thing I had ever eaten. I'll never forget standing in my kitchen with Danny, eating it from the pan and just looking at each other saying, "Everything is going to be OK now. We have this cake." We could have brought home triplets, and I would have felt equipped. There's a lot to be said for the benefits of good, home cooked food when you are emotionally and physically low on reserves. Remember that the next time a friend has a baby or an operation or something. Sure flowers or another baby blanket is a nice gesture, but how about a crock pot of Beef Bourguignon...and an apple cake. I called Linda up a few months later and requested the recipe. She laughed and said it was a 'very popular' recipe and got a lot of reactions. I understood why. OK, so of course I changed a few things, but not much. My raspberry bush was still yielding fruit when I made this cake, so I tossed in a few handfuls between the layers of batter along with the apples. The recipe originally called for a dusting of cinnamon at this point, but I reached for my microplane and grated Tonka bean over the fruit. You should always use a light hand when working with Tonka bean as ingesting too much of it can be a health hazard. Preheat oven to 350F. Butter an 8 inch round cake tin and line with parchment. Beat eggs and sugar until light and fluffy. Beat in oil and almond extract. Sift together flour, baking powder and salt. Fold into egg mixture. Spread half of cake batter in tin. 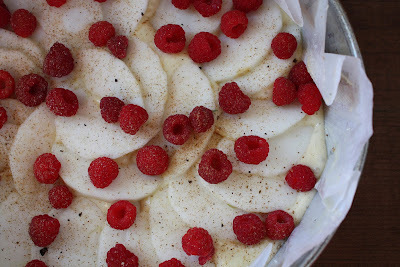 Cover with sliced apples and raspberries and sprinkle with tonka bean. Cover apples with the rest of the batter and bake for about 45 minutes. This is my entry for October's Sugar High Friday event hosted by Anita over at Dessert First. Anita chose spices as her theme for this event and I originally didn't have anything to submit, but when I took my first bit of this cake and the tonka bean quietly, yet masterfully, stole the show away from the fruit, I knew I had nailed it! Check out Anita's blog on October 31 for the entire SHF roundup. You did such a beautiful cake for the event. Mmmm comfort food, I'll have to try this apple cake the next time I know someone in need of some edible comfort :) Hi to Danny and the boys! 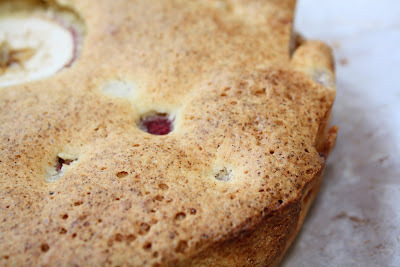 I adore apple cakes...never had them with raspberry and it sounds delicious. I have a couple of Tonka beans...can't wait to try this out! I've never heard of Tonka bean before, sounds really interesting. Sounds like it's pretty hard to find though. how beautiful! i love your pretty pink cake stand!! 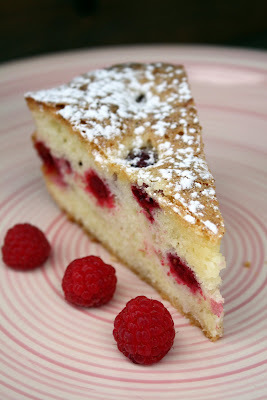 The raspberry is a really nice accent to the cake. An apple cake does sound like perfect comfort food. Thanks for passing along the recipe. Now I don't have to have a baby to enjoy it! Hi Amber- Don't wait too long, OK? Hi Veron- Sounds like you're all set. Hi culinarywannabe- It's banned in the States, but talk to Tartelette, she has her ways around these things. Hi Heather- Thanks, it's one of my favorites. Hi Val- Cinnamon is lovely, too. Hi Patricia- You can spice it up any way you like, then! Hi amyruth- I used Cortland apples, because that was what I had just picked! Thanks for stopping by UtHC! We LOVED this! I used fresh ground nutmeg and fresh ground cinnamon and it was amazing, the perfect sweet for an afternoon snack. Ohh, that looks so pretty and yummy ! How would you describe the flavor of tonka beans compared to vanilla (or cinnamon, as you say)? Hi Michelle- Glad you enjoyed it! 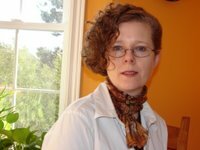 Hi veggiegirl- Thanks for dropping by. Hi Michele- No, I wouldn't compare tonka to cinnamon (but cin. 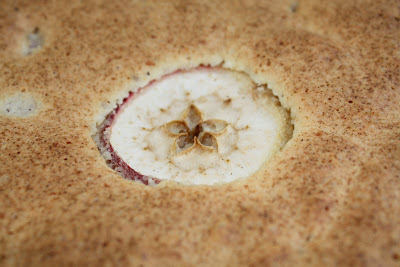 would be lovely in the cake) but rather it's like a combination of vanilla and almond with hints of nutmeg and coffee. It's really something! I love using it in creme brule. Wish I could get my hands on some tonka beans, but I guess it's okay. I don't want to OD.